My father has found an old choir picture from 1966 or 1967. 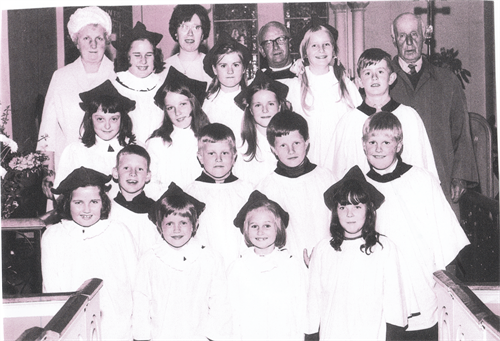 The East Huntspill Choir children all attended the East Huntspill County Primary School when the formidable Miss Wesley was the headmistress, my mother Joan was the secretary and the dinner money lady! Penny Knolwes I believe is still living in Nut Tree Close and her father used to help rehearse the choir for some time with Sue Elsworth accompanying us on the organ. They were good days when we were all so close. The Vicar used to have summer fetes in his garden at The Vicarage in Withy Road. The children would be in fancy dress andthere would be games to play and races to enter. The Local Mayor & Mayoress would cut the ribbon and I remember being chosen one year to present The Mayoress with a boquet of flowers. There would be a marquee with flowers, fruit & vegetabales on display. The ladies of the village would enter beautiful cakes, jams & chutneys, there was always fierce competition over the produce on display! Tombolas, coconut shy, raffles, bottled stalls, knitted toys & homemade sweets. I will never forget Miss Wesley’s Coconut Ice!! Every year there would be a Sunday School Outing and I remember a coach full of villagers going to Butlins at Minehead! 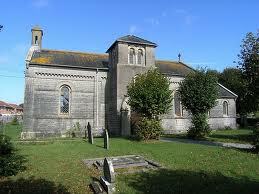 In the Church hall there was always regular Jumble Sales, 50/50 Auctions, Beetle Drives, WI Meetings and Sunday School. Harvest time was always a joyous occasion with The Church looking beautiful with local produce displayed around the alter, I remember the sun pouring through the Church Stain Glass Window lighting up the flower displays. The Harvest Home was a major event with a parade starting from the orchard past the old Post Office at the top end of Bason Bridge going down to the Church, the fair site was in the field opposite in those days. My Mother and Mrs Nancarrow with a few other ladies were in charge of the Church Flowers. The ladies also got involved in making the cross stitch kneelers that adorned the church. My mother & I used to cycle around the village delivering the Parish Magazine. My first ever job was keeping the bus shelters clean. I would cycyle from one end of the village to the other with a broom and a bag for the litter in my shopping basket! Anyway, thankyou for bringing back some many memories and I wish you luck in your continued research. We lived in New Road next to what was the Lamb Inn, as a child I always enjoyed playing in the skittle alley!